As an innovative company, HomeChoice Planners and Construction Corporation continues to venture in different services that would keep the company growing. HPCC offers services such as general construction, architectural designing, construction management and interior designing. One of the in demand services that HPCC gets to work on is interior designing. With the company’s elite and customized designs, clients and prospect buyers are seeking out for the company’s interior designing service. 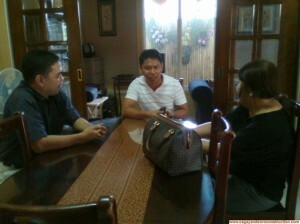 Recently, HPCC was able to render its interior designing service to one of the units at Primavera Residences. Just an overview, Primavera Residences is the first green building condominium here in Cagayan de Oro City. 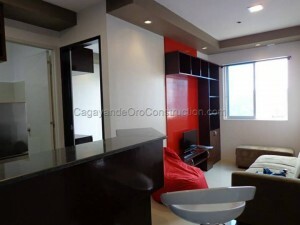 The said condo is located at Pueblo de Oro’s business park beside SM City mall. And HPCC worked on a 1 bedroom unit in the said condominium. It took the company approximately one month to work on the interior design of the said unit and just last 27th of June it was turned over to the owner of the unit. This project is an addition to the company’s portfolio for interior designing. And HPCC is privileged to have work on such project because it did not only recognized the company’s ability in interior designing but it also made the company known for working in one of Cagayan de Oro’s pride condominiums. Kudos to HPCC and Primavera Residences for this collaboration! 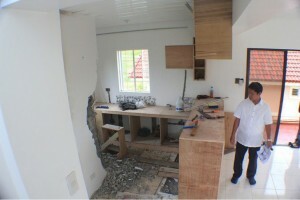 Mr. & Mrs. Gamit’s Interior Works: The Blessing Day! It is really great! We are honored to say that at last, the Gamit’s family is now in its newly turned-over and finished interior works we did. Unhidden feelings there would be from us, because, in a way, we helped the family have their house desire, even with that not that big house they acquired from Bloomingdale subdivision. But, what make us so excited and that gay with this? It is the result or the outcome of our architect’s mind, our construction workers hard work and very kin to details, just to make the detailed plan be followed as it is, and of course, the help by God to have it successfully done with due time and effort by every one in the office and the people in Gamit’s family. 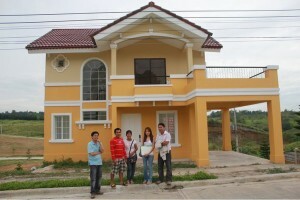 Today, October 8, 2011, they are having their house blessing at Iponan, where this unit they have is in. This will be the first day for the family to live in their ever prepared house after their exchange of vows. This will be also their first memoir for their starting family and with their soon to be born baby. It is very pleasing to ears that we will be part of their lives story and their continual support for each other and for making their family bond tightly. From all of us in the office, we would like to sigh: “Welcome and Congratulations to both of you, Mr. & Mrs. Gamit for your newly done house! Being in the world of marriage is quite a big game for everybody. Thus, upon having like this status, the family must also be innovated with the things they need for the starting family to be. This is what Mr. Lucilo Gamit, our client, thought upon being into marriage. He had extended to us his house concern for his family. He got a house and lot in Bloomingdale, Iponan. The one he avail is the Aspen unit of the said subdivision. As what we all know, the unit is only having a bare condition, which needs to be improved with its interior and exterior phases. And as part of our duties in Homechoice Planners & Construction Corporation, we used to improvise any house we encounter and make it possibly be made elegant, magnificent and on its total make over. 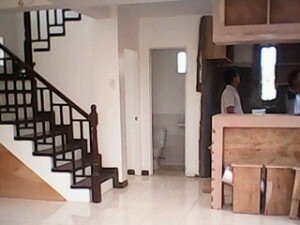 As our detailed report for this another interior works we have in Iponan, we have the following photos for you to view. We made its ceiling, floor tiling, kitchen cabinets and room cabinets, kitchen slabs, paintings, room embellishing, fixtures and the pin lights or lightings as well. Just like the other projects we have, we make sure the quality and the client’s desire for their house would be granted according to the given budget they have. Just like this one in Iponan, Mr. Gamit, just utilize the sources and funds they have to start their family. And we are proud to serve and say that with all of our duly worth, we did it best! This project is already turned-over as prompted to us, due of the family’s need to be in the house already, though there is still a bit of things to be done with the closet and the cabinets’ coverings. 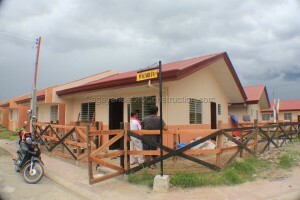 To some up this project, it is a small, yet enough and practically made beautiful house for the newly started family of Mr. Lucilo Gamit and his wife and soon to be born baby! In behalf from Homechoice Planners & Construction Corporation staffs and construction workers, thank you for the chance for us to make your house to be that great with its complete house amenities now! Those are the improvements for the unit that are really presentable now to look at. As our first project in the area, we are happy as well to serve this client with full support with her house interior preferences. Soon to be, we will start with the fencing of this property as part of the plan and with the contract. We are hoping for smooth-sailing work for this one, so just keep on following our update for this project guys! As our first Interior works projects, this house is on its progress this time. We are glad to present the development in La Mirande area. Our main work here is the floor and the built-in cabinets as well. As of July 14, 2011, we have this update for its interior enhancement. 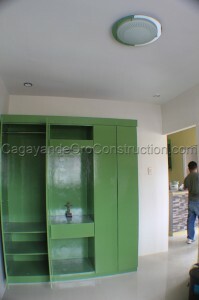 For now, it has its tiled first floor, with its on-going built-in cabinets that are soon to be done with its paint colors. For its second floor, it is now on its wood tiled flooring and attached built-in cabinets for each bed rooms and the almost are almost done. Soon to be, and a bit of furnishings to be done, this interior works are all well be done. We will keep on posting for the development of this project and will let all of you know its step by step progress! Or you may LIKE US on facebook! Though house construction is our core service to offer, we also have this other offers that number of our clients to enjoy with. We have this house renovations and interior furnishing as well. Yes, we have these offers too! With this, you can also submit to us your ideas first, of what you want your house look like would be, or its plan to be specific. Then we will be the one to improve it. Just like this one we have in La Mirande, Grand Europa, we have this newly proposed interior furnishing for Mrs. Alberastine’s newly bought two-storey house. This is another project we have for house interior. As we know, there are houses that needs to be furnished even it is in ready for occupancy condition. Mrs. Alberastine is one good proof for this. She just bought a house in La Mirande, with its very beautiful surrounding, though she needs her new house to be furnished in its interior. What we did in Homechoice Planners, we first discussed vividly with her the concept, then made implement it to the area. As its update as of June 14, 2011; it has the tiled floor, soon to be done built-in cabinets for the kitchen, bed rooms, and on every toilet & bath tile and accents with its fixtures, as well as the wood tiles for every bed rooms. This will be a soon to be done project we have, since this is only interior furnishing. We are thankful to render service like this, to practice and widen our exemplary and more than satisfactory performance ever since. This is will be a start, neither to be the second, third nor to be the last! You can avail this one too! Just contact us, and for sure we will be on time to serve you with our best. Though there are projects which are to be done this month, the Homechoice Planners & Construction Corporation has now new projects to accomplish. Just yesterday, October 22, 2010, our office head had talked with our new clients to have the proposed project to formally line up. Mrs. Eileen S. Letaba & Mr. Roberto M. Letaba, BDO head and a General Manager, in Cagayan de Oro City, had decided to have a house renovation. They would like to make their house look more contemporarily good with it’s on the trend design and aura. As of now, the Homechoice Planners & Construction Corporation’s workers, already on the area and just started their work in the area of the said people. This will be done as soon as possible, as what the owners are expecting to. This is just one of the proofs that the office is doing well in the field it is in, and the excellence it can offer to every client. We don’t know these people for long time, but they have laid their trust and confidence to the performance and the service we can offer them. This is because; we work not just because of earnings, but by the good service and quality products to be for each of our clients. We envision the best for every client; we are the Homechoice Planners & Construction Corporation team!